Google has evolved into being more than just a search engine. From the humble search box, you can find a wealth of information: from data on public transportation, to the political positions of those running for president. And now you can use it to convert between RGB and hex color values. RGB and Hex are both ways of identifying colors to a computer. Hex represents colors using hexadecimal notation, while RGB values display each color as a combination of red, green, and blue. For example, white is represented in hex as #FFFFFF and as 255, 255, 255 in RGB. Now when you search for a hex value, Google will return the RGB value. 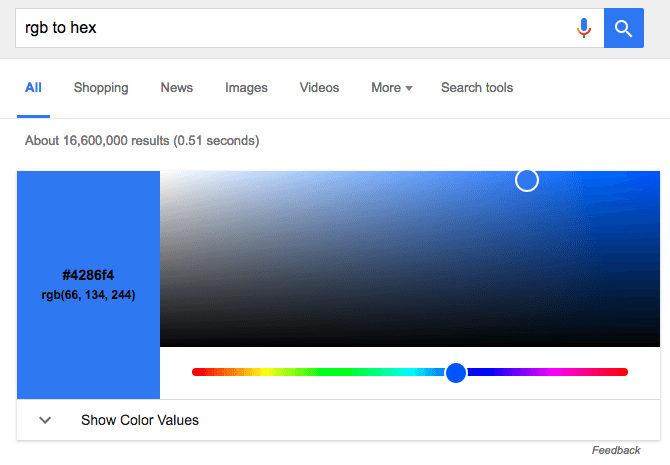 Likewise, when you search for an RGB value, Google shows you how that color is represented in hex. If you just wanted to explore the entire palate of potential colors and see how they’re represented, you can simply search for “RGB to hex”, or vice versa. This is a handy addition to Google. For those working in design, it will likely prove to be a helpful and time-saving tool.